Together, Memory Unearthed at the Portland Art Museum and The Last Journey of the Jews of Lodz at the Oregon Jewish Museum and Center for Holocaust Education (OJMCHE) will offer an extraordinarily rare glimpse of life inside the Lodz Ghetto through the lens of Polish Jewish photojournalist Henryk Ross (1910–1991). Situated in the heart of Poland, the city of Lodz was occupied by German forces in 1939. The Nazis consolidated the area’s Jewish population—more than 160,000 people—into a poor industrial section of the city, sealing it off from the outside world and making the Lodz Ghetto second in population only to the Warsaw Ghetto in German-occupied Europe. More than 200,000 people were forcibly relocated and moved through the ghetto during its four years of operation; a quarter of its inhabitants died of starvation and disease, while most were deported to concentration and death camps. Upon liberation by the Red Army in 1945, only 877 Jews remained alive in Lodz Ghetto.Henryk Ross, confined to the ghetto in 1940, was forced to serve as a bureaucratic photographer, making official photographs for Jewish identification cards and images used as propaganda promoting the ghetto’s efficiency. At great risk, Ross also documented the brutal realities of life under Nazi rule, culminating in the deportation of tens of thousands to death camps at Chelmno and Auschwitz. With the hope of preserving a historical record, Ross buried more than 6,000 of his negatives in 1944. When he returned for them after Lodz’s liberation, Ross found that more than half of the negatives had survived, and he spent the rest of his life sharing the images. 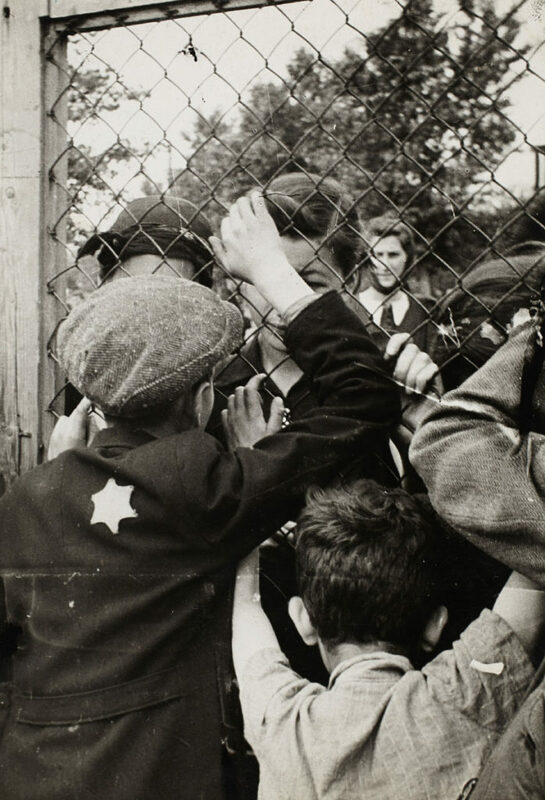 Some 125 of these photographs are included in Memory Unearthed; a visual and emotional meditation on a harrowing moment in history that demonstrates the power of the photograph.The companion exhibition, on view at OJMCHE, explores Ross’s efforts to design and publish The Last Journey of the Jews of Lodz; a multi-language book about life in the ghetto illustrated with his photographs. The Portland Art Museum and OJMCHE will serve together as the first West Coast venues for this critical body of work. Organized by the Art Gallery of Ontario in Toronto, Canada and presented in partnership with the Oregon Jewish Museum and Center for Holocaust Education. Curated for the Portland Art Museum by Julia Dolan, Ph.D., The Minor White Curator of Photography. *Miriam Greenstein survived three years in the Lodz ghetto, as well as the atrocities of Bergen-Belsen, and a slave labor camp in Germany. After liberation, 16-year-old Miriam came to Portland to live with relatives. A graduate of Grant High School, Miriam lived quietly as a housewife and mother until the 1988 hate crime murder of Ethiopian man Mulugeta Seraw inspired her to begin speaking about the consequences of hatred and intolerance. She dedicated the next 30 years of her life to Holocaust education and offered her support of this exhibition before passing away in April 2018.